The Zell am See-Kaprun region is surrounded by mighty mountain peaks. Lake Zell lies in the centre. You can enjoy an active holiday at any time of year in this part of Austria. Enjoy sports, health and local and international culinary specialities. In summer you can swim in Lake Zell and also still go skiing in the Kitzsteinhorn mountains. The combination of glacier mountains and lakes in one region is quite unique. The water in Lake Zell can be used for drinking water and is ideal for swimming, watersports and boat trips. If you prefer a little more peace and quiet, you can visit Austria’s new wellness oasis, the TAUERN SPA, with outdoor heated pools, a large sauna complex and many beauty treatments available. Take a pleasant walk in the Schmittenhöhe and surrounding mountains, enjoying the view of Austria’s most beautiful mountains, such as the Grossglockner. The Gipfelwelt 3000 situated in the Kitzsteinhorn mountain at 3000m allows you to experience the Hohe Tauern mountains in all their glory. Walk with rangers from the Hohe Tauern National Park into Austria’s most beautiful nature reserve. Climb the Kitzsteinhorn mountain and discover the first 3000 metres – guaranteed to be the most thrilling experience of your active summer holiday in Austria! Multi-faceted nature that never fails to enchant. Hiking is an especially satisfying experience in Zell am See-Kaprun. The spectacular combination of glacier, mountains and lake is nothing short of unique and guarantees unforgettable insights into Austria’s nature.Scale a peak in the Salzburg province. Pleasure is the main focus of all hiking possibilities in Zell am See-Kaprun. Your hikes will present wonderful panoramic views, sparkling mountain lakes and blooming mountain pastures. Rustic Alpine huts and mountain restaurants supply weary hikers with traditional delicacies. Regardless of whether you prefer challenging hikes or more relaxed walks, the Zell am See-Kaprun region has something in store for everyone. You can scale the Schmittenhöhe and Maiskogel on foot or via the cable car. Once you have reached the “Gipfelwelt 3000″ on the Kitzsteinhorn glacier, you have the option to take a guided tour to the summit (3,203m altitude), which offers a unique view of Austria’s highest mountains, including the famous Grossglockner. The mountain reservoirs with 160 million m³ of water fascinate many hikers every year. In summer the crystal-clear Zeller lake is the perfect place for swimming and paddling. Swimming in the 23°C warm water of the lake in the midde of the alps is an unique experience. Our lidos have heated pools too – so you can enjoy swimming even in early and late summer. But the drinking water quality lake is also a great location for boating, sailing, stand up paddling, kayaking, diving, fishing and water skiing. You will encounter the element of water in a variety of forms throughout all seasons in the Zell am See-Kaprun region. The Kitzsteinhorn glacier is covered in ice and snow all year, which ensures you can even enjoy winter landscapes in the midst of summer. Or maybe you prefer a little hike to theSigmund Thun Gorge or the Alpine reservoirs of Kaprun for a refreshing “cool-down”. Every summer you can enjoy water from a different perspective: theSeezauber – an awesome water, light and lasershow at the lake. The joy of exercising is the main object when cycling in Zell am See-Kaprun. Diverse cycling tours have something in store for everyone, regardless if you are sporty or prefer a more comfortable pace. 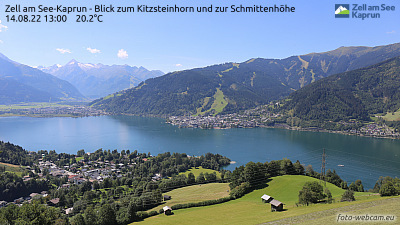 Zell am See-Kaprun is well-known for its diverse cycling paths. The offering ranges from short, flat tours to challenging mountain ascents. You can explore the surroundings cross-country on a mountain or trekking bike. The well developed cycling paths in the Salzburg holiday region are highly suitable for families and cyclists that enjoy travelling at a comfortable pace. You will find numerous inns and cafes on the wayside to cover your refreshment needs. Are you looking for a special challenge? The multi-day tour on the Tauern cycling path takes you on a 325km trip from Krimml to Passau. Even untrained cyclists can easily master the tour on e-bikes. E-bikes are available for rent at various stations in the Zell am See-Kaprun region. This enables you to explore the region without breaking too much of a sweat. A charged battery allows you to cover a distance of 60km. But that does not mean you are limited to that range. The battery can be recharged at the aforementioned rental stations. For kids the Schmitten is offering a special e-bike motocross parcours.